Retreads the same old territory - literally. I really don't know what to do with this, the 200th episode of the series. It was a solid episode, but I didn't enjoy it, because it retreaded - all to literally - territory that has already been beaten into the ground. There is nothing about this episode that we haven't seen before, and I'm starting to get tired of it. At every single level, this episode has been done before. Stewie's time travel machine is practically a cliché. In the premier, Stewie and Brian went back to the first episode, so we've already trod that ground. Every other scene is either a replay of a classic scene, or a new scene that is in itself stale (like the Yet Another Giant Chicken Fight). I am reminded of Star Wars jokes. Every single Star Wars joke that can possibly be made, has. Not just by Family Guy, I'm talking everyone everywhere. But we keep making Star Wars jokes. Why? Clearly the general public has a much higher tolerance for "the same stuff over again" than you would think. After all, isn't that what made McDonalds and Starbucks so incredibly popular? Seen from that perspective, from the perspective of someone who will never get tired of the usual Family Guy antics, this was a pretty successful episode. They managed to squeeze a little bit more funny out of some old scenes, and tinkered with some new scenes in an odd and nonsensical (wouldn't everyone be speaking backwards, too?) fashion. But I am not that person. I grow weary of Yet Another Giant Chicken Fight. I am saddened by the use of the time machine again. I don't find it comforting. Why would I? If I wanted to watch those things, I would go watch them in re-runs. You can find a Family Guy rerun five times a day in my cable market, not to mention Netflix. It isn't soothingly familiar. It looks to me like Family Guy has plain old run out of ideas. 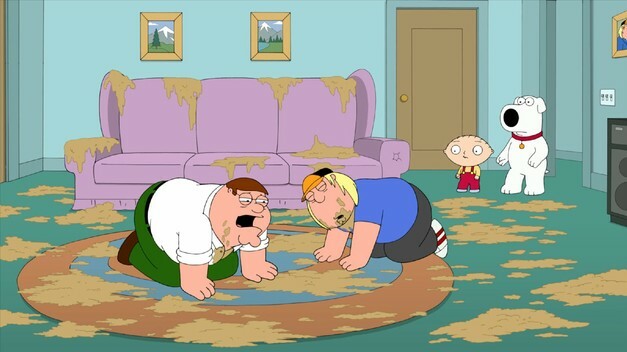 They can literally do anything they want in an episode of Family Guy. They could send the characters to Mars, or kill one off, or add a new one. Send Meg off to college. Move across the country. Grow gills and live under water. There's six ideas off the top of my head, and I've barely finished my morning coffee. But no: we are forced to relive the show all over again. Le sigh. "The Old Man And The Big C"